The Dallas Morning News ran a full-page spread in their print edition comparing the speeches of Democratic presidential candidates announcing their candidacy. They used TagCrowd to visualize and compare the words the candidates are using most. It’s a neat use of the technology to make what Edward Tufte calls “small multiples“, small information-dense graphics that afford easy comparison. Boingboing, the eminent “directory of wonderful things”, today posted a TagCrowd-produced image of Bush’s State of the Union 2007. 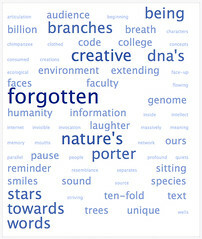 The tag cloud was made by Jason Griffey. Thanks, Jason, for making a fascinating cloud. Thanks to a bug report from Jason, which led me on a short development spree, you can now embed the code for your tag clouds into blog posts and other content-management systems. If you encounter any problems, please let me know what platform you’re using and I’ll jump on a solution. Now when you generate your spiffy new cloud, you get the HTML source code along with it so you can easily post it on your own web pages and blogs. The code and its rendered image are released under an Attribution-NonCommercial Creative Commons License, which means you are totally free to copy, distribute, display and modify your clouds as you please — as long as you give a little hat-tip to TagCrowd for making your clouds shine. We’ve finally achieved the founding goal of this webapp: make it easy to generate and publish a word cloud using any text source. Enjoy, and please keep the feedback coming. Thanks so much for your great ideas and praise! Tonight, TagCrowd made its (physical) world debut at a Stanford faculty retreat in Half Moon Bay. I created a name tag for each professor by dropping their research statements and resumes into TagCrowd to create a cloud visualization of their interests, projects, collaborators and activities. The primary goal of these personal visualizations was to facilitate the formation of new collaborative research teams on the basis of shared interest. By making interests mutually visible when people meet each other for the first time, these “name tag clouds” can identify areas of overlap, complementary expertise, and opportunities for potential collaboration — all in a brief glance. They also serve as conversational props that ease the introduction process: the clouds present conversants a rich set of topics for inquiry. Looking around the room at any given time I witnessed circles of intellectual elites huddled intimately together, pointing playfully at one another’s clouds. Lera Boroditsky said that virtually every conversation she was in was about the cloud or referred to it. 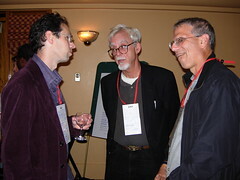 At right: Dan Jurafsky, John Perry & Tom Wasow chat it up at the cocktail party with their clouds around their necks. I saw some of the brightest minds in the world with child-like grins and heads tilted navel-ward to see the constellation of words and concepts that others were seeing: the alphabetic poetry of their lives scrawled across their hearts, as it were. Here is my own name tag from the event. 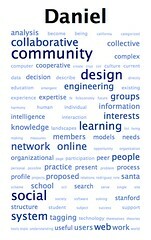 As far as I know, this is the first application of tag clouds in a face-to-face community. I got a lot of good feedback from the participants. In general people were impressed by how representative the clouds were. The most common request was the wish to see a time-lapse animation of how the cloud visualization of one’s research interests evolves over the span of a career. Jeremy Bailenson suggested that color could be used to represent the time dimension even on a static picture like a name tag. My latest interests would shine red hot, regardless of size. Past passions would loom large and cool. Terry Winograd (pictured at right with Eve Clark) had one of the most valuable pieces of user-experience feedback when he told me that he needed his glasses to read peoples’ clouds. He’s far-sighted and so it does no good to just get closer. Note to self: bigger words, fewer words. Thanks, Terry. And thanks to all of you for taking part and having fun doing it. I got such a kick out of it, I can’t even tell you. You may have heard of AOL’s recent search data snafu where they inadvertently released 35 million user search queries without properly anonymizing the data. While they have ceased sharing the data, it is all over the Net already and people are already creating data mining tools for it. For fun, here is the tag cloud for the top 500 search queries. Not the most interesting cloud I’ve seen — more than anything it betrays the ignorance of users who type website names and addresses into AOL’s search field instead of the browser location field. Alternatively, you could read this as a signal of how useful the “I Feel Lucky” button is to the average user. Though I don’t actually know if AOL’s search engine has this button. Many many bug-fixes have gone live. 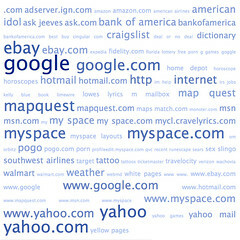 Your tag clouds are more accurate than ever and the interface has been tweaked to address many usability issues. Clouds away! I’ve been showing TagCrowd around to friends and colleagues lately (easy user testing). It’s fun to watch people get into playing with it, seeking out ever-more interesting texts, speeches or poetry to visualize and compare. It made me realize that TagCrowd needs a photo gallery of clouds, each linking to its source text. I find that newcomers to the tag cloud are enamored by its gestalt typographic aesthetic more than anything else. More than a few people have said they want a tag cloud print to hang on their walls as cybermodern art. Some want t-shirts with visualizations of their resumes. 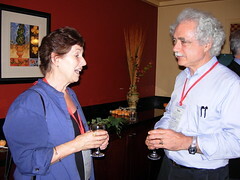 Roy Pea and I spoke yesterday about printing tag clouds on name tags for a September gathering of researchers. Imagine walking around with a tag cloud dangling from your neck, meeting people and glancing down at their name tags to see the vocabulary of their interests and expertise. In a sense, you can see in that glance how to speak their language. Know to call a shoe a shoe. And know to ask about their interest in dolphin language or C++ compilers or Japanese architecture. Roy always reminds me to ask, What’s missing from the model? For instance, what word should be in my tag cloud that isn’t? After all, it does not adequately sum up my life to run my CV through the TagCrowd shreddder — monotonous and academic as it may be. But it’s a start. Cory Doctorow’s seven obstacles to meta-utopia guarantee we will never have perfect metadata. But we will have plenty of rough yet reliable approximations. A tag cloud made from a CV may not be the most empirically rigorous way of assessing someone’s research interests, even a narrow band of them. But it’s a great approximation for being so quick and easy. A hand drawn sketch instead of a photograph; the tag cloud is information impressionism: what it lacks in exactitude, it makes up for with good looks. Fuzzy information can be useful too, as Fred Turner told me today. You can learn a lot from a sketch. Since I now apparently have a growing user community (all ten of you! ), I decided to add an easy feedback form for reporting bugs, making feature requests, declaring your undying love, etc. Update: As of this writing, about two years after this blog post was first published, TagCrowd’s community has grown to an average of 700 unique visitors every day. Now that’s humbling. By far the most-frequently requested feature has been a way to prune certain irrelevant tags from tag clouds — i.e. create a tag blacklist. Of course, everyone has a different opinion about which tags are irrelevant and, moreover, those opinions change depending on the particular text being visualized. What was needed was a way for users (you!) to create many different blacklists and be able to choose the one applicable to your current task. Introducing the Tag Scrubber. It’s still in its infancy, but currently allows you to create and edit any number of tag blacklists. As of now, all blacklists are shared among all users. If I ever implement user accounts (bureaucracy, eek! ), you can have your own private collection of ’em. Until then, please refrain from divulging your deep dark secrets in alphabetic lists of irrelevant words.